In order to provide you with better services and members-only features we need to ensure that you are a valid member of the ZR-1 NET Registry. Many features, like renewing your membership, update your account automatically and so require logging in to be able to correctly identify you. How do I log-in to the site? Near the top of the screen you should see a gray box saying "Login". Click on this and enter your username and password in the screen that appears. We suggest you tick the "Remember Login" option on the Account Login screen. Note that logins for the website and forum are different right now. I don't know my username/password. How do I find it? You can recover your password by clicking on the Login link near the top of the page and then clicking the "Retrieve Password" link. This will display a screen where you can enter your username or email address to recover your password. Note that if you enter an incorrect username or email address other than the one we have on file then you will not receive that password reminder. The email was lost in transmission. The email reminder system is usually fast. If you have not received anything within 6 hours, please check your spam folder. If there is no reminder there please contact our Webmaster (webmaster@zr1netregistry.com) or (president@zr1netregistry.com) and they will reset your account details and send you new login information. Note: We can't recover passwords only reset them - this is for your security. How do I join the ZR-1 Net Registry? You can join or renew your membership online through the store or by printing and mailing the forms at the bottom of the How To Join page. I'm a member but I don't see the Renew option in the store, just "New Membership"? The most likely cause is that you are not logged in correctly. If you see a gray box containing the word "Login" then you're not logged in. If you have lost your username and password please see the help topic entitled "How do I login?" All members and past-members as of December 2012 had an account set up for them. In order to maintain your member records, please follow the instructions to recover your account details rather than creating a new account. 1.. First login (very important step!) if you can't login because of a lost password and/or username please see the help section entitled "How do I Login?". Note: There is no longer a single username and password for access for the webpage. You must use your own personal login name and password. 2. Once logged in, hover your mouse over the word "MARKETPLACE"
3. Click on "REGISTRY STORE". 4. Now click on "Membership". 6. Now click on "Renew Membership"
7. Fill in the details including your membership number if you want it to show up when you check out. Please stand-by for info on ordering more than one T-shirt. Note even if you're using a card continue to click on "Place order now". You can continue to check out using your CC via PayPal as a guest or if you have a PayPal account you have the option to use it. Please note: iPhone users have reported issues with the store. Please renew on a regular computer. I joined the website and forum but I don't see the members-only sections? Setting up an account on the website and/or forum is free, but it is not the same as joining the ZR-1 Net Registry club. If you haven't paid membership fees then you are a "Guest". If you have paid membership fees, please email (membership@zr1netregistry.com) and he will check your status and ensure your account is updated appropriately. I've not recieved any email or my membership pack and T-shirt, how come? The ZR-1 Net Registry does it's best to maintain it's records but it is important that you help us by ensuring your contact information is correct. Our primary contact is through email, so if you change your email address you need to make sure we know about it. Also your address needs to be accurate in our records for any membership mailings. Please see "How do I make sure my contact information is correct?" for details on how to check and change your contact details. You can now ensure that your contact information is correct through the website. This is important as these records are our primary way of keeping in touch with you. Once logged in to the site, click on the gray box with your "nickname" near the top of the screen, as shown below. The screen is in three parts. 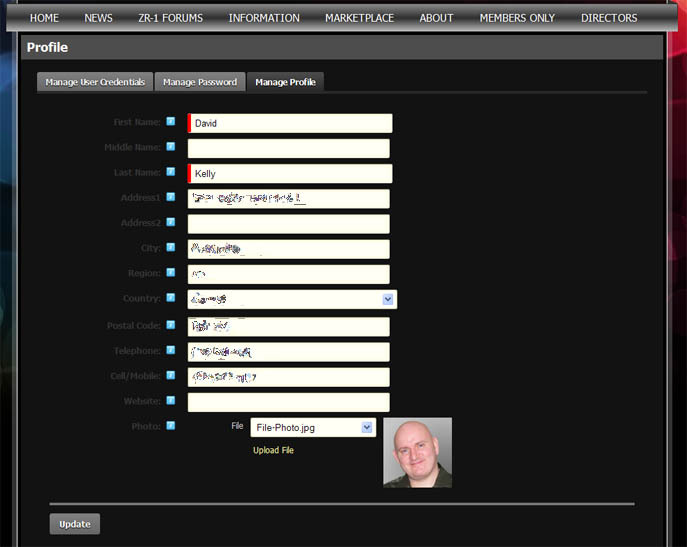 The top section shows your basic profile and contact information and a photo representing you (if you’ve uploaded one). 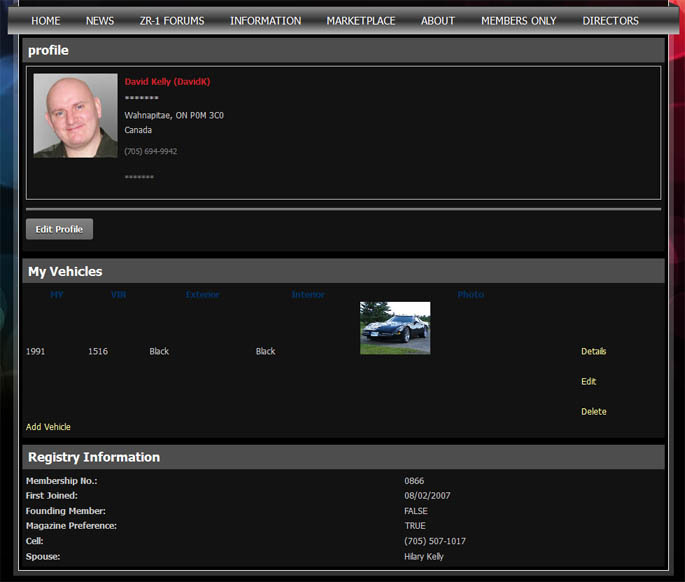 The middle section displays any cars that you have added or are in the registry records as belonging to you. At the bottom is basic information on you held in the ZR-1 Net Registry records – registry information is not editable directly, if there are any mistakes please contact the membership director, George Jones through membership@zr1netregistry.com (note that the Registry information panel will only be displayed if you are a current member of the ZR-1 Net Registry). 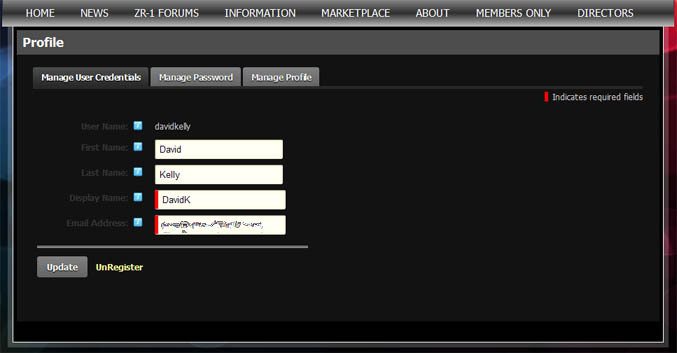 The first tab “User Credentials” displays your basic account information and allows you to change it. Your user name (used for logging in) is fixed, but you can change your Display Name and email address freely. The Display Name is like your nickname on the registry forum and will be what other people will see when using the new site features. Note that if you change the information here it is not applied until you click the “Update” button. Also if you change your name you may make it difficult for the Registry to provide special member features in the future. The next tab allows you to change your password. Your password should be memorable and known only to you. Your password should be changed from the default when you first login and after that can be changed at any time you wish. Note that password changes will not be applied until you click the “Change Password” button. The final tab allows you to change your contact information. This can also be changed at any time and it is strongly suggested that you keep it up to date at all times. You can also upload a photo or image representing you – this is optional and will be displayed in some of the advanced features of the site. The information entered here is considered confidential and is not available publicly. Note that any changes are not applied until the “Update” button is clicked. You can register your car through the Profile section of the website. 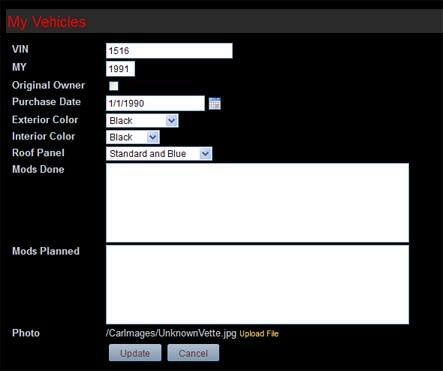 This section allows you to add, modify and delete ZR-1s that you own so that they will be viewable through the Registry. If the Registry already has information on vehicles you own they should appear in this area by default. Here you can change the information on this vehicle. Note that any changes made are not applied until the “update” button is clicked. 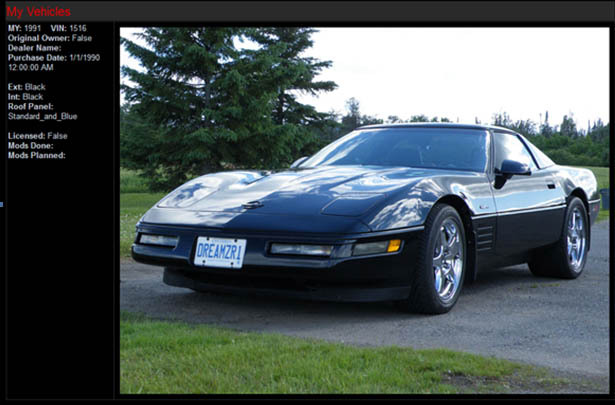 You can also upload a picture of your car to replace the “anonymous ZR-1” using the link at the bottom of the page. If you do this your vehicle details will look similar to the display below. If you have more than one vehicle, simply click the "Add Vehicle" link and enter the details of your other cars. 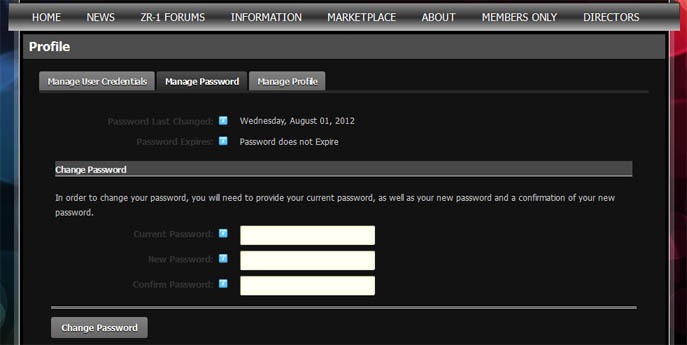 I can log in to the forum but not the website, how come? The forum and website have different logins right now. E-mail our Webmaster(webmaster@zr1netregistry.com) for help with either. I can log in to the website but not the forum, how come?